Here I have another apple post, but I was given about 1/2 of a bushel of fresh from the tree apples so I need to use them. I've had this recipe for Crockpot Applesauce bookmarked since last fall when Barbara posted it. This was the perfect time to try this wonderful recipe. Homemade Applesauce is delicious, and I like mine with a bit of tartness to it. The apples given to me were Red Delicious, which are very sweet and I rarely buy them for that reason, but I added some tart Granny Smith apples to the mix, and the applesauce was amazing. If you haven't ever had homemade applesauce, you are missing a great treat. It is so much better tasting than store bought. Here's how it's made. Peel and core the apples and cut into large slices. Place apples in crockpot and add the sugar, cinnamon, lemon and apple juice or water. Stir. Cook on low for about 8 hours, or on high for about 5 hours. Stir a couple of times during cooking. When done, you can mash the apples or puree them to the consistency that you like. I use a potato masher on my applesauce because we like it somewhat chunky. My crockpot apparently cooks faster than some, because my applesauce was done in 3 hours. So I mashed it, placed it in a bowl and let it cool, and put it in containers in the refrigerator. I love it served cold the best. The lemon juice adds a freshness to the apples. It is tart, yet lightly sweet, with the wonderful flavor of cinnamon. It's good! NOTE: Taste the applesauce while it is hot. If it needs more sugar, it will easily be incorporated while the sauce is warm. Thi s look super delicious. I have never made applesauce, but have been thinking about it alot. This sounds great since I can make it in the crockpot!! 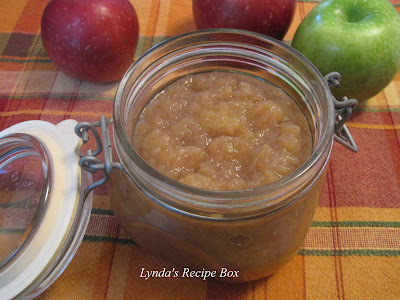 I've never made homemade applesauce - it looks and sounds wonderful! I love the idea of the crockpot! We are going apple picking next week! Great recipe! I like that you mixed some Granny's in - I'm the same way, preferring the more tart apples over the sweet. Course I would love if ANYBODY gave me a 1/2 bushel of any kind!! This would be so good with kids in the house - I wonder if my grandkids eat applesauce? Will have to check with my DIL. Thanks for sharing! Love the mixture of applesauce and really love that it was done in a crockpot. I do not use mine enough. Thanks for visiting The Sisters Cafe! I so wish someone would give me a bushel of apples. Homemade applesauce is sooooo good. I'll have to get some at the Farmer's Market and try this crockpot version. Looks and sounds awesome. Passing this one along to my daughter-in-law who makes all her baby's food. I'm guessing that using all sweet apples, she could eliminate the sugar entirely. LOVE crockpot recipe! Love homemade applesauce, but I've never made it in a crockpot! Simple! what a simple way to make delicious homemade applesauce....I would never have thought of a crock pot! Yum! It sounds really good! I love all things apple.... and all things easy. This fits the bill! Great recipe for fall! My kid loves apple sauce....I should make some at home. I bet your house smelled amazing when you applesauce was cooking! Lynda, the use of the crockpot is such an EXCELLENT idea. I love this!